Hot summer days and strawberry milkshakes just go hand in hand. Ok so maybe not the best choice for dinner but oh so sinfully good! I know everyone is surprised to learn that the chocoholic chose strawberry but that's the healthy helping of fruit that makes it ok to only have a milkshake for dinner. LOL! Clarice is trying to cram her head into the cup to get the last little bit of goodness and you know how much I love her because I'm letting her do it. She's gotten to be such a big girl but still here's a couple pictures from her little tiny kitten days....Clarice's nightly spa treatments. She weighed less than 1/2 a pound when she came to live with us and my how she has grown since then. I mentioned yesterday about my first swap and I think it might just become addicting to want to be a part of swaps now. I entered Jennifer over at Feathers In The Nest giveaway for a wonderful Blackbird Designs pattern that shockly I don't already own. It's an Americana design and she's doing a giveaway in honor of all the soldiers that have given so much to all of us. The first 5 people who comment on this blog post...will receive a handmade gift from me. In return, you must write a blog post explaining Pay It Forward and send out handmade gifts to the first 5 visitors who leave a comment on your post. Don't be stressed...there is no need to send out the gifts all today or tomorrow. Any time in the next few months is fine. No pressure. This is meant to be fun. 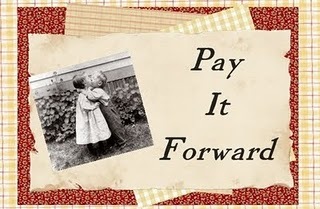 So if you would like to take the Pay It Forward challenge please comment on this post. Recovering Slower rather than surer!